The EU–Japan Partnership in the Shadow of China: The Crisis of Liberalism (European Institute of Japanese Studies East Asian Economics and Business Series) est le grand livre que vous voulez. Ce beau livre est créé par . En fait, le livre a 282 pages. 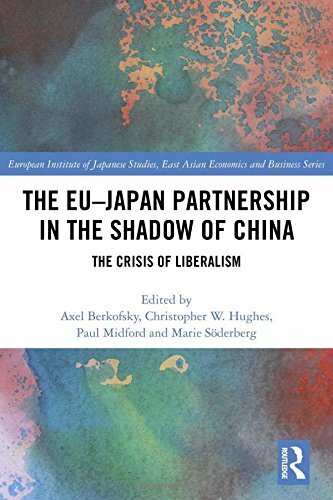 The The EU–Japan Partnership in the Shadow of China: The Crisis of Liberalism (European Institute of Japanese Studies East Asian Economics and Business Series) est libéré par la fabrication de Routledge. Vous pouvez consulter en ligne avec The EU–Japan Partnership in the Shadow of China: The Crisis of Liberalism (European Institute of Japanese Studies East Asian Economics and Business Series) étape facile. Toutefois, si vous désirez garder pour ordinateur portable, vous pouvez The EU–Japan Partnership in the Shadow of China: The Crisis of Liberalism (European Institute of Japanese Studies East Asian Economics and Business Series) sauver maintenant.